this was a surprise. finished downloading the whole show a month ago and had a blast watching it. the film wasnt my favorite but the broadway show just became one. its music and the cast is infectious, it’s been weeks since i saw it and the songs are still looping in my head. the show’s audience clearly enjoyed themselves and cheered at every instance it’s contagious. ang kulit! 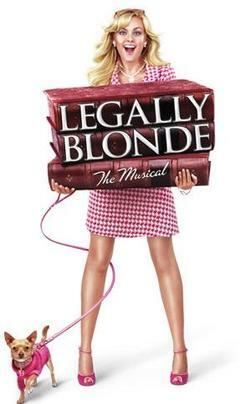 laura bell bundy plays elle woods in the original cast and she got nominated for a tony award here. fantastic choreography and staging in “what you want,” where elle applies for harvard, “chip on my shoulder,” and tracks 17 and 18 “legally blonde” songs. for more information here’s the wiki page of legally blonde the musical. finally watched mamma mia. everybody knows abba and whether you like it or not, youre all familiar with their music. heard of the musical years back but had no idea how itd work out. all i know was that it was a hit so i was excited meryll was doing the film (exec produced by power couple tom hanks and wife rita wilson). meryll frontlined the casting of evita in the movie version (along with michelle pfeiffer) before madonna eventually got the role. everybody waited a bit before we could hear her sing her guts out in a musical. the first part of the film was frivolous and i didnt get into the act so much. it was fun yes but may be a bit stretched. however, when it got to “voulez-vous,” to meryll’s heartwrenching rendition of “the winner takes it all” and all the way to the end, the musical was a winner. the people in the screening applauded at the end of the film (gateway LFS july 25 2008 ) and that was great. wonderful night cap playing “thank you for the music” at the credits. sweet! i want i want !!! had ubber fun at mogwai cubao april 2008 to reminisce the good times and celebrate egan’s photo exhibit. i unfortunately didnt make it to the exhibit (the shop was closed when i got there), i only got to the drinking hehehehe. love you guys! just arrived from mindanao. brought over from cdo a lechon, 1kl of tuna jaw (panga) and 750 grams of tuna for kinilaw (including cdo’s famous tabon tabon). also brought bread hubs’ cinnamon rolls and sler’s chicharon. carlo prepared the now famous silofen cafe tuna pasta (dami kasi ngtanong sa recipe afterwards), garlic potatoes in butter, cheesecake and the crowd favorite all-around cheese sauce. people brought over 3 bottles of wine and 3 different kinds of cake. all for the late bday celeb of ben (june28) and early celeb of carlo (july13). yey! despedida of tita penny and tito ramon, after enjoying a week long stay in cagayan. the dinner turned out to be a mini reunion as the seniors were in attendance. daddy ongcs and mommy lolet. tito ne and tita baby. tita leone. the bulans, esguerras, tongcos, padero rer and velez, mai mai and son paolo, johnmark, mike and zeny, dodjie and krystal (christian), katrina, and kirby with boyfriend and baby andre, ta edna borja. so the new iPhone 3G is almost here. according to news, theyll be released 8am july 11 in the states. what about us in the 3rd world? i dunno. perhaps if you have some rich uncle in the freeworld you could ask him to send you one. unfortunately there are a few pros and cons as i just found out through yahoo. also if you were getting the phone through AT&T (apparently they have a 5-year exclusive contract with apple to carry iPhones in the US; in the Philippines, Globe will carry iPhone 3G), there are additional charges on top of their released price of $199 and $299 per unit. so parang hindi din siya ganun ka-cheap considering youre locked in for 2 years in contract. Will the new iPhone also be available here in the Philippines? Yes—the iPhone 3G is “coming soon” to the Phillippines, although Apple hasn’t given a specific date yet. Here’s a complete listing of countries slated to get the iPhone. Will this new phone work outside the U.S.? Yes indeed—it will work on any GSM network, including those in Europe, Asia, and the Middle East. Can you send pictures between iPhones? The iPhone doesn’t support picture mail, a.k.a. MMS (multimedia messaging). Then again, there’s nothing stopping you from sending pictures to iPhone-toting pals via the iPhone’s email client. Is the camera on the new iPhone gonna be as useless as on the first iPhone? What about a flash? Apple has confirmed that the camera on the iPhone 3G is the same 2-megapixel model as on the original—and nope, there’s still no flash. Personally, I’m fine with the iPhone’s camera, and besides, the little flashes on most camera phones are too weak to appreciably improve picture quality. That said, if you hated the iPhone camera before, you’ll still hate it on the 3G version.